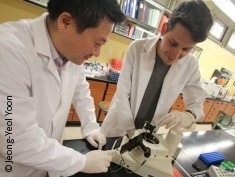 A new diagnostic device created by a collaborative team of University of Arizona engineers and scientists may significantly reduce the amount of time necessary to diagnose tissue infections. When a patient arrives at a hospital with a serious infection, doctors have precious few minutes to make an accurate diagnosis and prescribe treatment accordingly. Doctors’ ability to act quickly and correctly not only makes a difference to the patient’s outcome, it determines whether the infection spreads to other patients in the clinic, and can even contribute to the development of drug-resistant bacteria. Luckily for patients and doctors alike, a new diagnostic device created by collaborative team of UA engineers and scientists may significantly reduce the amount of time necessary to diagnose tissue infections. The device’s novel approach to molecular diagnostics, called DOTS qPCR, is faster, more efficient and less expensive than alternatives currently being used in clinics. The work is described online in the journal Science Advances. Pathogens and infectious diseases are typically detected using a technique called polymerase chain reaction, or PCR. The method involves rapidly heating and cooling DNA molecules from a biological sample in a process called thermal cycling. This results in the amplification of the target DNA into millions, and even billions of copies. Scientists and physicians can then use the copies to identify the type of pathogen causing the infection. The problem is that most PCR tests can take up to an hour or more, and a physician’s decision-making window is typically less than ten minutes. DOTS qPCR, invented by Yoon and his research group, stands for droplet-on-thermocouple silhouette real-time PCR. The technology relies on the measurement of subtle surface tension changes at the interface of a water droplet suspended in an oil medium. The water droplet, which contains the target DNA to be amplified, is moved along a heat gradient in the oil to begin the chain reaction. As more copies of the target DNA are produced, they move towards the oil-water interface, resulting in measurable changes in surface tension. Remarkably, the size of the droplet can be measured using a smartphone camera, providing a method to observe the course of the reaction in real time. Yoon emphasized that DOTS qPCR is inexpensive compared to its counterparts, which employ costly and time-intensive testing methods involving fluorescence detection, lasers and dark chambers.